Over the course of the last few months I have been carefully watching the growing debate surrounding the showing of live broadcasts or recordings of theatre in cinemas and live streaming to anywhere you want to watch. Theatre has generally resisted these modes of reaching a wider audience, although opera, particularly the Metropolitan Opera in New York and the Royal Opera House in the UK have been pioneering it for a number of years. It comes as no real surprise that live streaming has started to take hold and is expanding rapidly. Cinema-based and arts venue showings are on the increase as well as specific services, like Digital Theatre which allow for anytime, anywhere access to a growing range of live filmed, but post-produced, edited performances. National Theatre Live is the National Theatre’s groundbreaking project to broadcast the best of British theatre live from the London stage to cinemas across the UK and around the world. Though each live broadcast is filmed in front of a live audience in the theatre, cameras are carefully positioned throughout the auditorium to ensure that cinema audiences get the ‘best seat in the house’ view of each production. Where these cameras are placed is different for each broadcast, to make sure that cinema audiences enjoy the best possible experience every time. Satellites allow the productions to be broadcast live, without delay, to cinemas throughout the UK as well as many European venues. Other venues view the broadcasts ‘as live’ according to their time zone, or at a later date. They have rapidly expanded the programme and now broadcast co-productions, as well as their own work, from across London. The statistics are impressive – seen by 1.5 million people in 500 venues around the world, half of which are outside the UK. ……has attracted little critical or academic interest despite its profile. Whilst the current paucity of literature can be attributed to sheer novelty, its cause is certainly hindered by its lack of a name. Those working within the film industry have found it useful to use the term “alternative content”; those without hanker after a moniker more focussed on what the format does rather than what it doesn’t. While some aspects of Livecasting may allow a greater number to claim ownership of the ritual, film is at the same time a fundamentally distancing medium; it positions the cinemagoers – structurally – as outsiders, a problem that the architects of the experience spend a good deal of time repressing. The debate in the UK was really ignited by the decision of the Royal Shakespeare Company to start broadcasting to cinemas too, alongside the National Theatre broadcasting it’s anniversary performances on BBC Television. First to write about this was Dominic Cavendish in The Telegraph with a piece simply entitled, Should live theatre be shown in cinemas? At around the same time Pilot Theatre live-streamed, for free, its production of Blood and Chocolate, an immersive, promenade piece which is still available to watch on Youtube. It is here that differences start to occur. The National Theatre and The RSC are only making their broadcasts available at a specific time, in a specific venue while Pilot are making theirs available at anytime as long as you have access to a computer. More about Pilot later. Almost simultaneously came the news in an article in the Canadian Globe and Mail, entitled Stratford Festival to film productions for worldwide theatre distribution, that the Southern Ontario Festival was planning to do something similar with a view to international viewing. On Wednesday night the Royal Shakespeare Company joined the growing band of arts organisations that are breaking down the biggest single barrier to access – the need to be there – by transmitting live their top-rated Richard II to cinemas around the UK. Audiences from Aberdeen to Ambleside, Taunton, Tamworth and Thurso – and many more in Ireland, Sweden, Canada and Malta – were simultaneously connected to Stratford for a three-hour rollercoaster ride through medieval England. Thousands of enthusiasts who could never otherwise have got a ticket were able to see the first of director Gregory Doran’s new cycle of Shakespeare’s history plays. Nothing quite beats being there, as any sports fan knows. Yet sometimes it felt almost better: the camera could close in on Richard’s ravaged face, and it could reveal the austere splendour of the gothic set: a seat in the gods and the front row. Being there can’t do that. Stephen Wood ……. warned that the National Theatre’s NT Live initiative must never become a “substitute” for actual theatregoing. The article, NT Live must not become a “substitute” for theatregoing, goes on in the same vein. However, the accompanying survey and comments would seem to disagree with Wood. Not surprisingly his comments garnered some criticism. My favourite is from the ever pragmatic Lyn Gardner in her Guardian Theatre Blog. 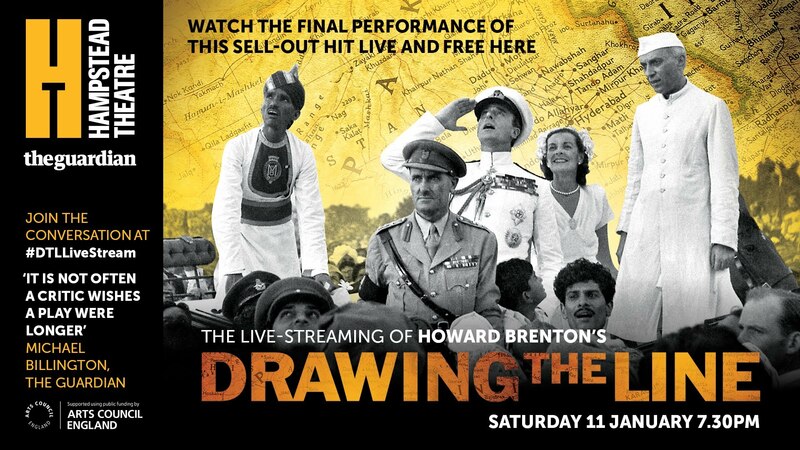 This was written only a few days after Wood’s comments, and another live streaming event by an independent theatre, this time of Howard Brenton’s latest play, Drawing The Line, which explores the moment when the line between India and Pakistan was made and British rule in India ended. The early 20th-century conductor Sir Thomas Beecham was not a big fan of the radio. He thought that if people could listen to concerts relayed in their own home, they would be reluctant to visit concert halls. He chided the “wireless authorities” for doing “devilish work”. I thought about Sir Thomas – who no doubt would be delighted to learn that the devilish Radio 3 hasn’t killed off the live concert – last week when Stephen Wood, executive director of the Stephen Joseph theatre in Scarborough, was reported in the Stage as taking issue with NT Live, which screens productions live to venues across the country and the world. Wood’s comments echo those of Michael Kaiser of the Kennedy Centre in Washington, who in a blog last year raised the spectre that digital downloads and screenings are threatening American regional theatre. He asked whether the baby-boom generation could be “the last to routinely attend live, fully professional performances” and suggested that the allure of being able to broadcast to huge numbers could make organisations who are using digital technology risk-adverse and lead to the collapse of regional theatre. Why will people go out to the theatre, particularly at a time of rising costs, he asks, when they can stay home and download or go to a local cinema? Probably for exactly the same reasons why live gigs are flourishing. Downloading your favourite band’s tracks is not the same as seeing them live. In both cases, Wood and Kaiser appear a little like King Canutes trying to fruitlessly hold back the waves. In both cases they appear to see digital as a threat to live theatregoing. Perhaps assuming that the 60,000 people who attended live screenings of David Tennant’s Richard II in cinemas are incapable of understanding that it’s not the same as actually seeing a live performance at the RST or the Barbican. I know perfectly well that fresh salmon and smoked salmon don’t taste the same but that doesn’t stop me from wanting to sample both. Not everyone has a theatre on their doorstep or indeed access to it. Many of the thousands of British schoolchildren who last November enjoyed a classroom streaming of Richard II and a live discussion with Tennant and Greg Doran would not otherwise have had the opportunity to see the show at all. But that doesn’t mean that their appetite won’t be whetted to go to their local theatre and see a different show as a result. Early research about NT Live found that it was more likely, not less likely to make people go to the theatre, and people who go to the theatre are more likely to go and see more theatre. More forward-thinking theatres understand this. They are not in competition with each other for audiences, and anything we can do to encourage theatregoing and make it a habit can only be good in what ever form it is distributed. Surely we should be celebrating the fact that the NT reached two million more people through screenings, not getting anxious about it? If anything it should be a spur to make theatres and companies all over the country wonder how might they might use of digital in interesting ways. Many already are. Some are looking at different ways of storytelling in projects such as Unlimited’s new initiative, Uneditions. I don’t think this is an issue that necessarily pits big against small, or London against the regions. It is more about open-mindedness and a willingness to be bold. It’s certainly not about ditching the way that theatre has been toured and delivered over hundreds of years, but rather about seeing the artistic possibilities of digital platforms and extending reach, capacity and audiences. There are plenty, from Pilot to National Theatre Wales and Hampstead, who are already doing just that. If they can do it then so can the Stephen Joseph, and others too. Michael Kaiser’s blog for The Huffington Post, that Gardner references, makes interesting reading, but is very doom laden. He suggests that the broadcasting by national companies will inevitably bring about the demise of smaller regional companies. However, he makes assumptions and asks questions with very little insight of the UK experience where it is regional and smaller companies who are embracing live-streaming to widen their audience base and bring in more people to their building-based work. I agree with the veritable Lyn Gardner completely. The mother of a friend of mine who is a regular theatre-goer, but doesn’t live in London, now watches the NT Live productions at her local cinema, but still goes to London to watch other productions, by other companies. I’m not going reiterate all the positive and supportive arguments made here in the articles and links, but to be able to increase the reach of a piece of work, both nationally and internationally, can only be a good thing. 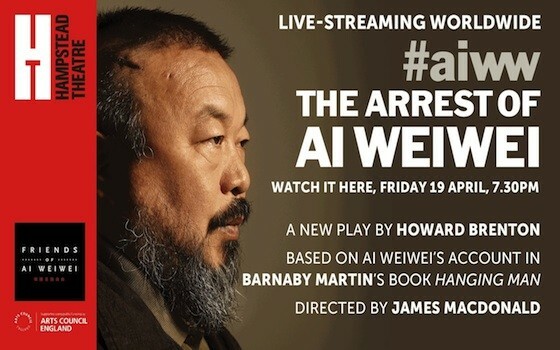 For example, the global live streaming of another of Howard Brenton’s plays last year, The Arrest of Ai Weiwei, has value beyond that of being an artistic and creative sharing. In the UK it means that people living outside London have access to some of the best theatre in the world and those regional companies with smaller budgets, doing exciting things, can have a reach way beyond their original remit, community and intent. The same will be reflected in any country where national theatrical institutions are based in a capital city, but are geographically and/or financially out of the reach of most of its citizens. With that in mind, Marus Romer, artistic director of Pilot Theatre, announced the launch of a new a project, via his blog, that aims to create a country-wide live streaming service, LiveTheatreStream.TV. Pilot have been pioneering live-streaming of their work and creative conferences for a while now and have a dedicated digital production team. I have posted this before, but here again is their live stream of Blood and Chocolate. Some are streamed live, are free and can be watched for a limited time only, again via computer. Some are recorded live, then broadcast later to specific venues, mostly cinemas, and are charged for but are not accessible in any other form. I find it all fantastic and exciting for so many reasons. As a theatre teacher, for so long I have had to make do with filmed versions of plays or one camera set-up recordings of live productions – neither of which are anywhere near satisfactory. As an English speaking theatre practitioner and theatre-goer living internationally, I am, of course, delighted by these developments. Having said that I am, so far, always disappointed when I go to the NT Live website and it tells me that I am 7,500km from my nearest cinema – the distance between Hong Kong and Melbourne, Australia. Mind you, this morning as I was writing, I have been back to the site and it is telling me that the broadcast venues are getting closer – I can apparently now watch Frankenstein and Coriolanus in Japan, the Philippines and South Korea – so now only 1,100km away. One can but hope. My original intent was to finish the post at this point, but as I said at the beginning and have hopefully alluded to throughout, the whole ‘genre’ is continually evolving, as are the discussions around it. However, a Tweet from yesterday led to another avenue of discussion, which very meaningfully adds to the debate about how we adapt the cultural landscape to take advantage of and make the most of live streaming. Elizabeth Freestone, artistic director of a well regarded small scale British touring company, Pentabus, wrote a blog yesterday, What live theatre screenings mean for small companies which, while supportive of what is happening, raises some very relevant, pertinent questions about the future. Whilst Freestone’s comments are about the UK, they could easily have a relevancy elsewhere as things develop. I run Pentabus, a small-scale touring company. We tour rural area – village halls, fields, colleges and pubs – taking our work into the heart of a community. We do this because people living in geographically isolated places struggle to have the same access to live arts their urban counterparts enjoy. Transport, pricing, time – all conspire to deny opportunity. So I’m thrilled live screenings give our audiences more opportunities to experience theatre near them. And I’m delighted the income venues get from live screenings (including bar sales) helps them afford to programme more live theatre in turn. But some of the infrastructure surrounding screenings can’t help but pitch one against the other. And if put into competition with each other, venues will always choose live screenings because they are much cheaper to buy than live theatre. The good news is, the problems are solvable. No doubt the debate will continue. Your thoughts? This entry was posted in Multimedia Performance, Theatre, Theatre Practice, Theatre Production, World Theatre and tagged NT Live, RSC Live, Streaming Theatre by Theatre Room Asia. Bookmark the permalink. Thank you for sharing valuable information. Nice post. I enjoyed reading this post. The whole blog is very nice found some good stuff and good information here Thanks..Also visit my page first date questions.